The Women’s Foundation of Colorado has created This Is What STEM Looks Like! a guide to introduce parents, caregivers, and educators to the many opportunities that STEM can provide girls and women. 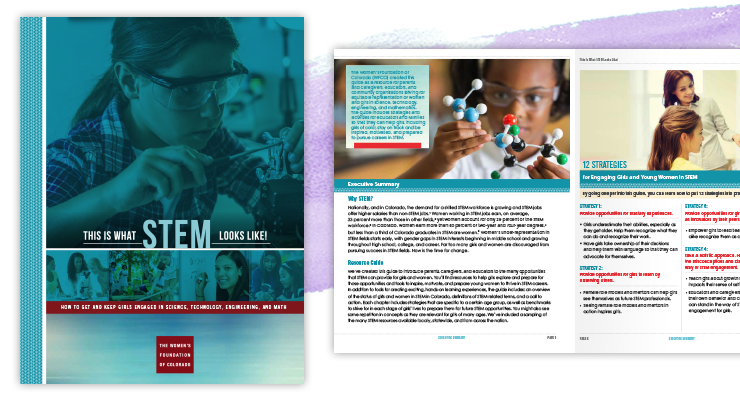 Through the publication, you’ll find strategies and benchmarks to help girls and young women — including women of color — explore opportunities and tools to inspire, motivate, and prepare them to thrive in STEM careers. Pretty Brainy is a top resource featured in the guide. Download the full guide to read and share with friends, family, colleagues, legislators and community organizations. Learn about the impact of Pretty Brainy in the words of girls, educators and parents. Explore Pretty Brainy’s full suite of STEM resources. From This Is What STEM Looks Like! Not all STEM experiences are created equal. Programs that place students at the center of the experience, where girls can do hands-on activities and investigate issues that inspire them . . . [are] very successful at engaging, motivating, and preparing girls to continue their interest in STEM. Take a closer look at Pretty Brainy and how their program integrates art into the STEM experience to foster curiosity and creativity for innovation. The time for discouraging girls and women in STEM is over. Girls need STEM learning to be self-sufficient and competent in the 21st century. Yet, among 4-year college graduates in STEM fields, less than one-third are women. Women working in STEM jobs earn, on average, 33 percent more than those in other fields. Globally and locally the demand for a skilled STEM workforce is rising. The Denver Business Journal reports that, for success in the workforce, business leaders want more students in computer science. Yet, in 2015, just 51 girls in Colorado took the AP test — fewer than 0.05% of all high school girls in the state. “In STEM Fields, girls will find careers that pay a living wage and give them the chance to make the world a better place with their ideas and innovation.” — Dr. Violeta Garcia, author, This Is What STEM Looks Like! Get your copy of This Is What STEM Looks Like! Download the full guide from the Women’s Foundation of Colorado and share with your community today.